I was out sick from work on Thursday and Friday, and feeling rather listless over the weekend, which is why you haven’t heard much from me.Â I did take a good chunk of time on Saturday to visit the DeYoung Museum and the Legion of Honor, which were showing “Balenciaga and Spain” and “Pulp Fashion”, respectively.Â The former is a collection of fabulous clothing by the French-Spanish couturier Balenciaga, with a few notes on the Spanish influences in his work; the latter is a group of interpretations of European costume (mostly dating back a century or three) done in paper by Isabelle de Borchgrave. I found “Balenciaga and Spain” to be fantastic – I wish I’d brought a notepad to scribble down some of the inspirations it gave me – but “Pulp Fashion” struck me as more a curiosity than something of intrinsic interest.Â It’s nice to know that you can make paper imitate cloth, but why not create the real thing?Â Of course, that wouldn’t be interesting enough to make it into a museum, which makes me wonder why.Â Is it part of the dividing line between “art” and “craft”?Â Seems rather odd. I should mention that there are four warp chains, arranged in pairs which are then painted different colors.Â In the top, I have done solid stripes of color across all four warp chains; in the second from the top, I’ve mixed the colors to give more gradual shading.Â The third features colors offset somewhat from each other, so the colors will blend when the warp chains are interspersed during warping; the last has mottled color.Â I’m not sure the last will be successful; it’s difficult to get both mottled color and good dye penetration.Â I do have some ideas for next time, though. Anyway, given my general listlessness and lack of motivation, it should be no great surprise that I muffed the threading of the painted warp.Â It was a fairly complicated setup, with three sets of lease sticks, and I accidentally swapped some positions that I shouldn’t.Â This resulted in the inversion of two layers of warp and a thoroughly unworkable result – only discovered, of course, after I had finished threading and sleying, and was getting ready to tie on.Â I said some bad words, then pulled out all the gold threads, which will need to be rethreaded, interspersed with the tencel threads. Other than that, some furniture alteration/rearrangement (my studio now has more open space and the desk has been lowered by 2″ to allow me to sit more comfortably at it), and shredding about 3 years’ worth of old credit card bills, not much got done over the weekend.Â Oh well; you can’t always have everything. The good news is that I am feeling much better today, so am hoping to get the warp fully threaded and start weaving today.Â Maybe a little ambitious, but, well, we’ll see. 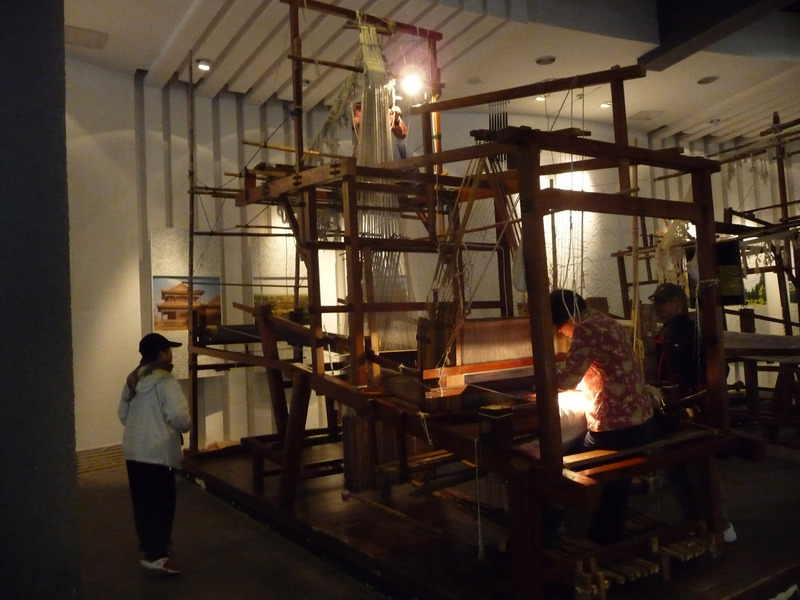 Mystery loom at Silk Museum in China. How does this work? This one intrigues me because there is no sign of treadles and there are a godawful number of frames.Â I suspect it may be a drawloom of some sort,Â but would love to know for sure; if anyone knows, can you please leave a comment to enlighten me? That has got to be the largest handloom I have ever seen.Â If you click to see the larger version you can see the person perched on top of the loom, manipulating the harnesses as the other person weaves. The English-language version of the museum’s website is here. Alternately, you may want to open the Chinese-language site in a parallel window or feed it into Google, since the English site seems to have most of its images missing. I knew I should’ve tried to get a picture of the display placard :b it was a fair way into the Big Gallery o’ Looms and the rest of my family was pretty loomed out. Supplementary online material says that the museum has 80 antique looms, but that doesn’t include all of the little mini-loom models. The websearch is giving me a vague tickle of a memory that this may’ve been described as a very early jacquard loom…? Duh – should’ve read closer, of course you know about drawlooms. 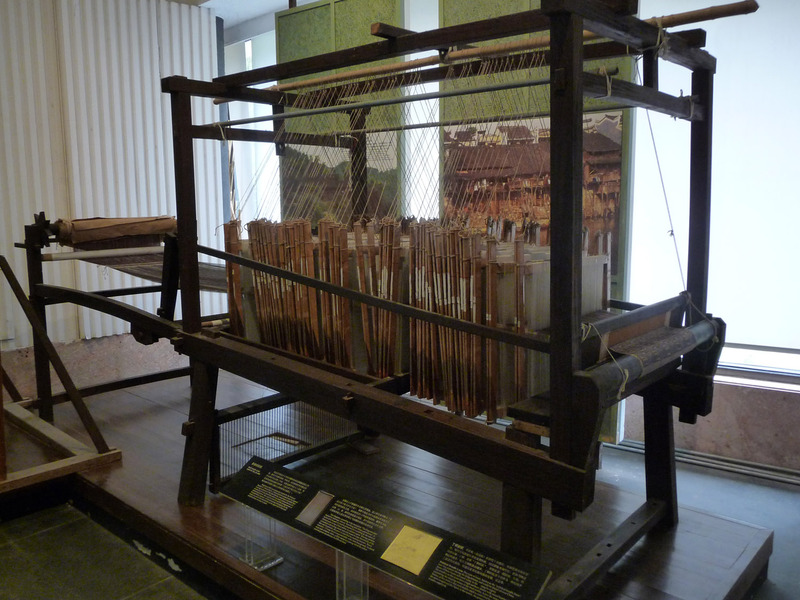 I still think it is one, but it’s a simpler model than the one below and possibly there are parts missing – it looks like the museum just hung the heddle frames in place, but didn’t restore the drawing strings or the mechanism for operating them. Mind you, I’m no expert of looms, just interested in textiles and history.